A room addition or renovation is an exciting project for any homeowner. Not only do you want to create a visually appealing space, but you also want to make sure that the new area is comfortable to live in. For this reason, you will want to do your research and make sure that your HVAC system can keep up with the new room. Because ductwork is likely to not reach the newly constructed space, the best solution to heating and cooling an addition is a ductless system. Flexibility to Fit Any Design - the indoor head can be positioned in many different locations with very little intrusion to the walls. 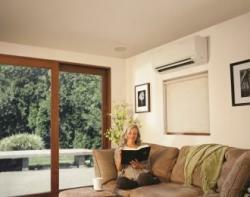 Maximum Efficiency - heat and cool the space only when necessary with some of the most efficient technology available. Quiet Operation - both indoor and outdoor units have been designed to minimize obtrusive sounds.